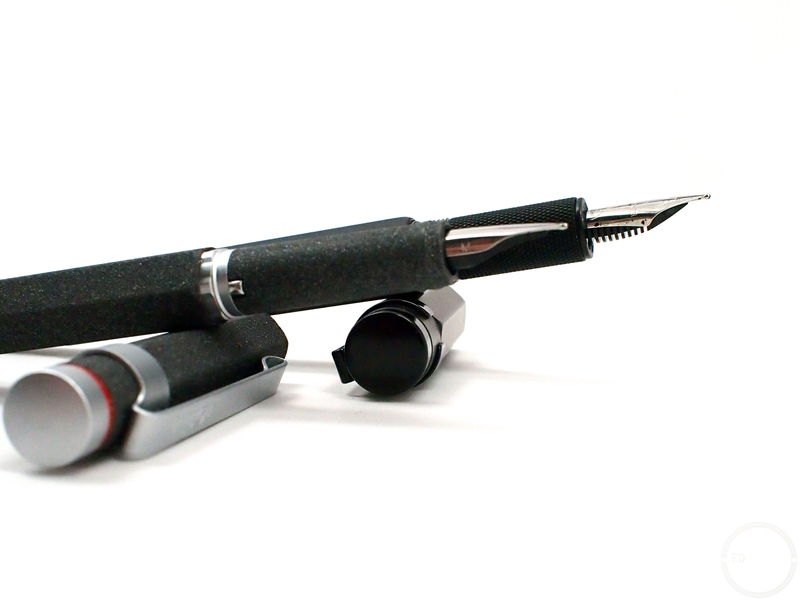 Description: An homage to Rotring fountain pens of the past, this solidly constructed metal pen is no knock-off. Levenger got in touch a few weeks back and offered up a choice of a few pens to review. It took me no time at all to figure out which one I wanted, the L-Tech Stealth. I’ve been eyeing this pen for a while now (it feels like I say this all the time, but I do eye a whole lot of pens) and it was awesome of them to offer one up to review. 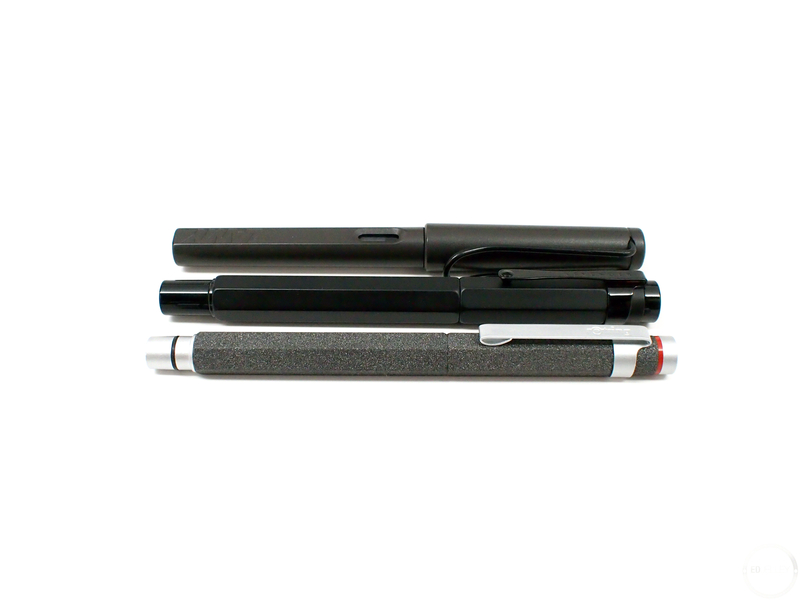 The L-Tech draws some heavy inspiration from the now-discontinued Rotring 600 line. The L-Tech has a faceted barrel, lots of angles, and to top it all off, a knurled grip. Check out the L-Tech Stealth over at Levenger if it’s something you think you would be interested in! The L-Tech came in pretty standard gift box. It was nothing too crazy, but it did a nice job of keeping the pen safe in transit. Some cool blacked out steal packaging would be cool too, but it would only drive up the cost of the pen for something that most people discard or immediately put into storage. The L-Tech Stealth is a great looking pen. 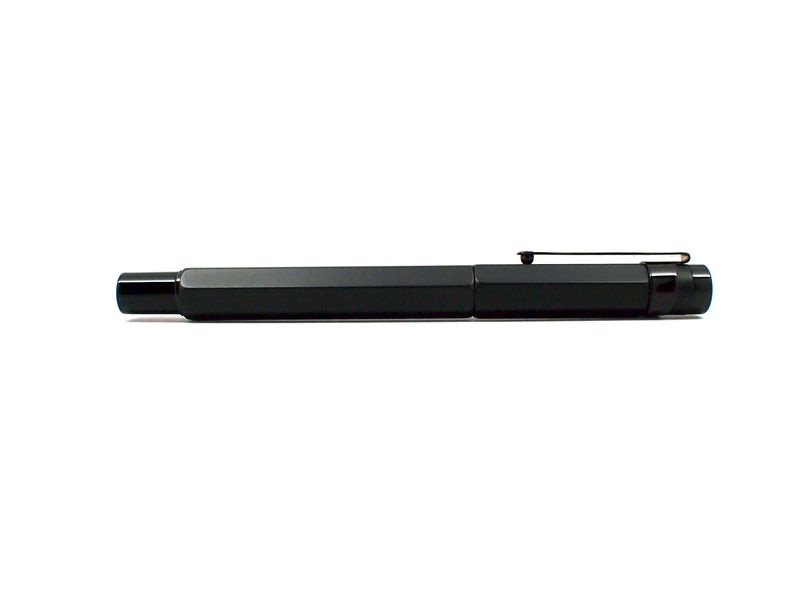 The mix of matte and gloss black adds dimension and gives the pen some character. 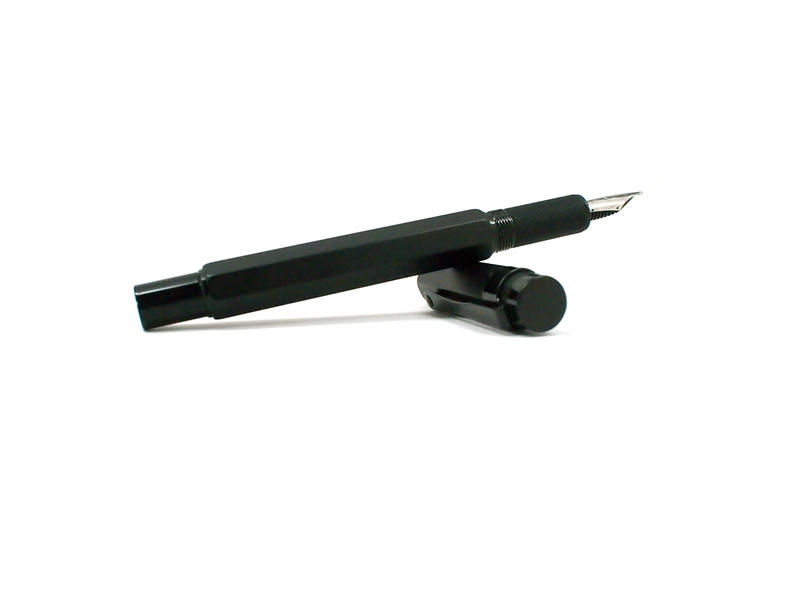 The tail section of the pen, the clip, the grip and top of the cap are all high gloss. 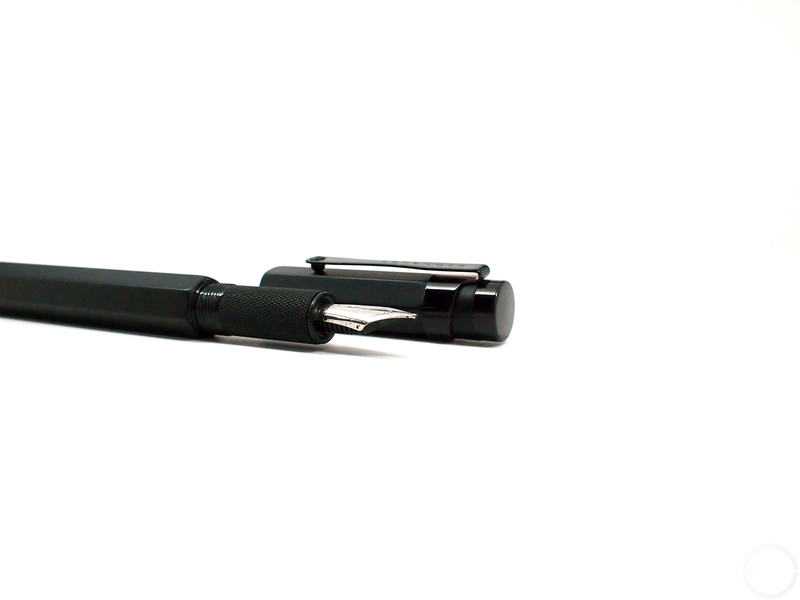 It’s a classy looking pen that would look at home on a desk or on a production floor. The 7-sided body is like a beefed up Rotring with an extra side. It’s a bit wider and heavier than my Newton (600?) Lava. 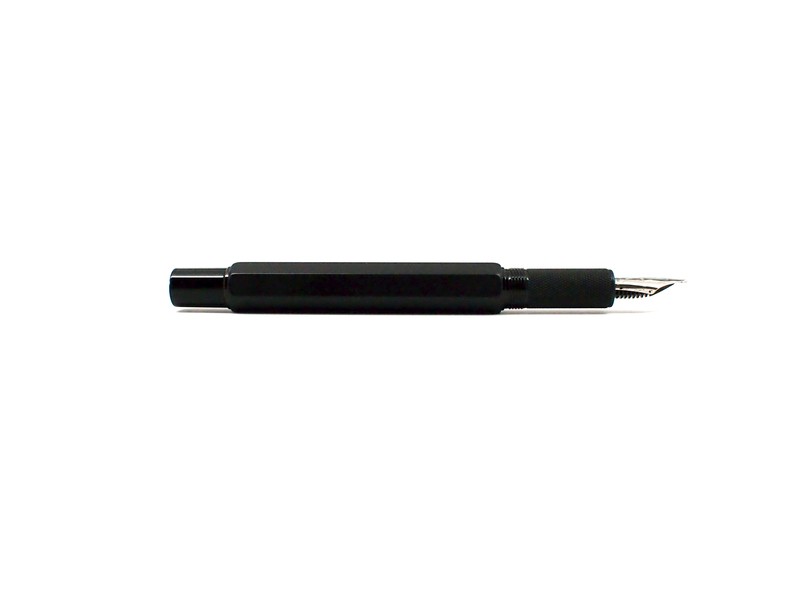 The knurled grip on the L-Tech Stealth adds a nice tactile touch and adds to the overall industrial aesthetic of the pen. 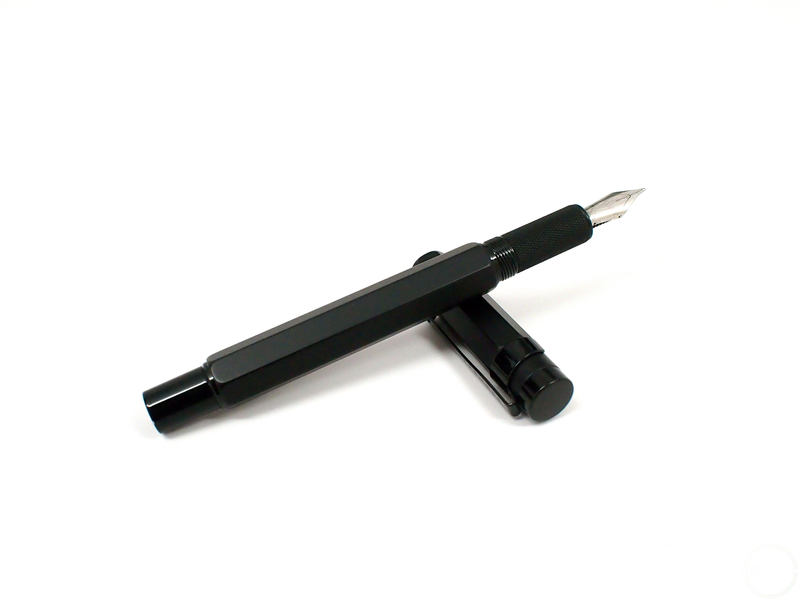 The nib is stamped with Levenger’s logo and some minimal decoration. Understated, but it matches the look and feel of the pen as a whole. The medium nib of the L-Tech Stealth came with a case of baby bottom. 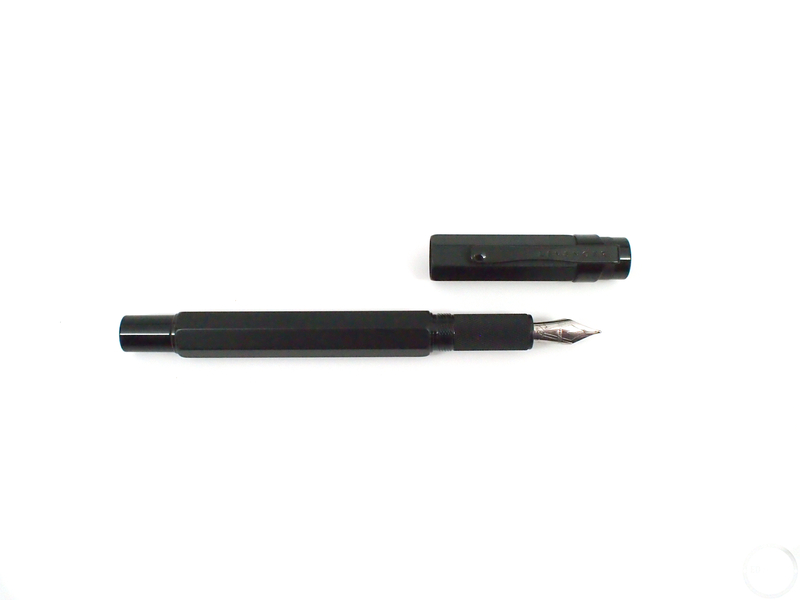 This phenomenon is when the nib of the pen curves inwards to the slit in the nib, making a flawed writing surface which gives the nib a hard time putting ink down on the page. I did some adjusting and smoothing of the nib with micromesh and it helped out quite a bit. I’m still experiencing some hard starts, especially on downstrokes. The steel nib is pretty smooth. It’s not the best I’ve ever used, but it’s certainly not the worst. It’s a standard size (I believe a #5) so I may dig through my collection to find another nib that works. The filling system here is your standard international cartridge/converter. The included converter works like it should, bonus points for including it with the pen. 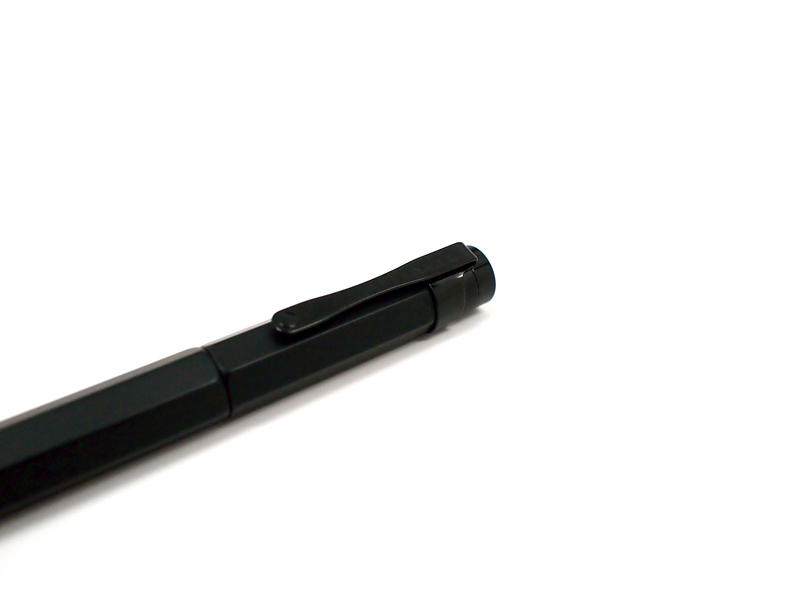 The L-Tech is a solidly constructed pen that has some real heft in hand. Coming in at around 44 grams, it’s nearly twice as heavy as a makrolon Lamy 2000. The L-Tech when posted is far too long and back heavy to write with, so removing the cap cuts down on the weight a lot. The pen has a great weight and balance when writing with unposted. The size is also ideal for my average sized hands. I don’t see the pen being a problem for small or large hands, but if you like a light pen, do your homework before jumping in with this one. The L-Tech is more substantial in hand than my Rotring Newton Lava. The added girth is welcomed, as the Rotring is on the thinner side. The knurled grip looks and feels great, but I prefer my knurling to have a bit more “tooth”. It’s still rough enough to add a nice amount of grip that improves control over the weighty pen. An improvement over the Rotring is that the Levenger has a screw on cap that lines up nearly perfectly. Rotring’s caps have to be precisely lined up before being snapped into place, but that is not the case here.  It’s a welcomed enhancement that makes the pen easier to use. 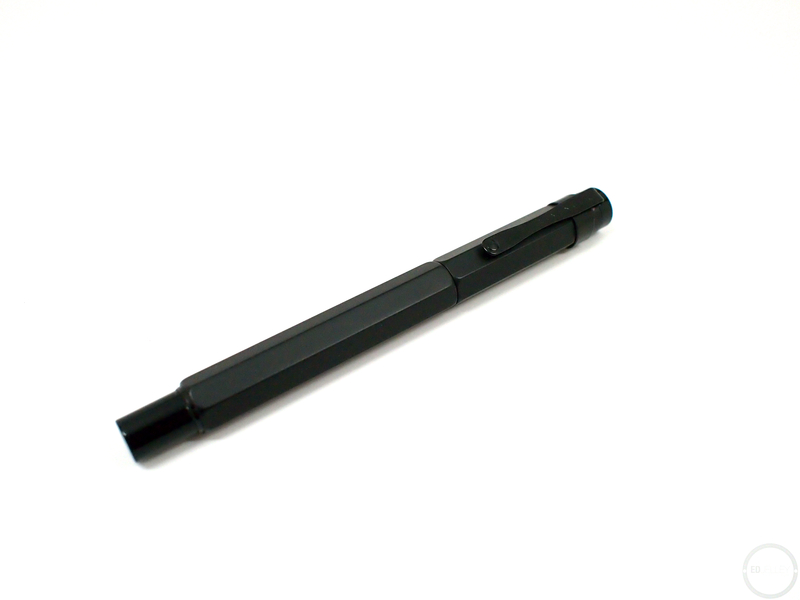 If you do not want to hunt down (or pay an exorbitant price for) a Rotring 600, then this is your pen. Construction is solid, and it feels great in hand. The nib could be a bit more reliable, but I’m sure Levenger’s customer service would be more than happy to help you out (just look at any of the negative reviews on their site). 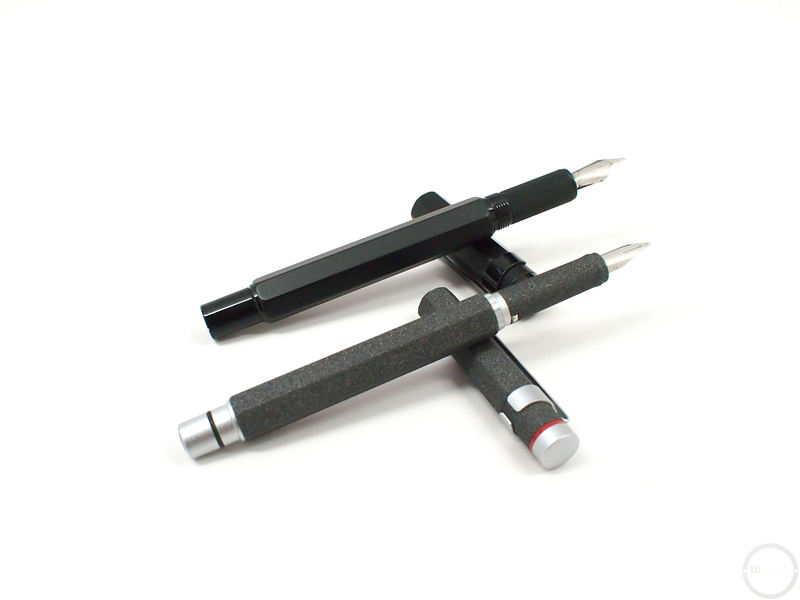 The L-Tech pulls heavy inspiration from Rotring, but it in no way a knock-off. I prefer to think of the pen as an homage, a very well done one at that. Thanks again to Levenger for sending the pen over, I can now cross another pen off my “want” list! Disclaimer: This pen was provided to me as a review unit, free of charge, by Levenger as part of their blogger review program. I was not compensated for this review, and this did not have any effect on my thoughts and opinions about the pen. Thank you for reading! I just got this pen on their Black Friday sale. I love the pen, but I had the exact same problem with the nib and when I contacted them they ended up replacing the whole pen (I wanted to make sure I didn’t void the warranty). The new pen is substantially better, but still has a little bit of the problem. Another slight issue I have with it, when you fill the pen out of a bottle do you have any issue with ink in the knurled grip? My fingers always end up stained with ink after filling no matter how much I wipe the section. Thanks for the review. I just got mine last week as well. Its an awesome pen. The TWSBI 540 nib unit swaps right into the section. Thats the first thing I did was to put one of my long cherished TWSBI 1.1 nib units in here. Works wonderfully!